You can export the data in a storyboard project in comma separated value (*.csv) file format. You can view this data in any application that supports comma separated value files, such as Microsoft Excel. If you do not have Microsoft Excel installed, you can save the *.csv file to your computer, and then open the file in another application. Select File > Export > CSV. The Export to CSV dialog box opens. In the Destination Path field, specify the location and name of the folder for the storyboard project’s data. ‣ Use the Field Separator menu to select the fields separator. ‣ Set the options corresponding to the data you want to export. NOTE: Refer to Tracking Changes to learn about Tracking Information. In the Export Range panel, select whether to export the entire storyboard, specific shots, or the last panel you selected. Either enter a space between shot names or click Select to display a window to browse scenes. 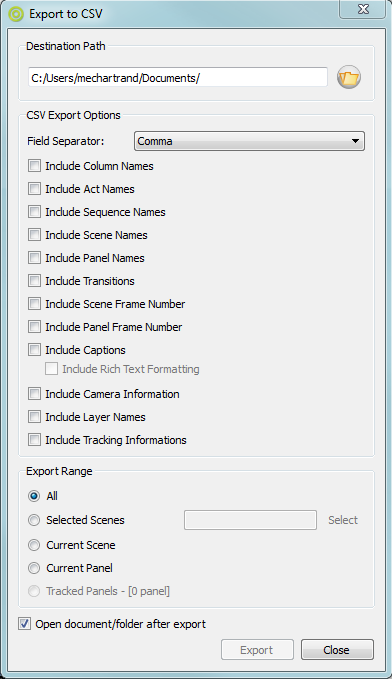 In the Scene Picker dialog box, you can select your scenes by sequence if your project contains sequences. To view the CSV file directly in Microsoft Excel or another application that recognizes the CSV format, select the Launch reader/player after export option.